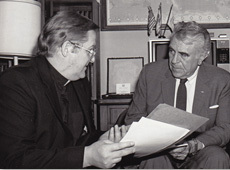 Sean Mc Manus with Congressman Ben Gilman (R-NY) in 1989. GOOD Friday, April 10, 1998. I was clearing my desk, to go home, when the phone rang. It was Dermot Gallagher, the secretary general of the Department of Foreign Affairs. He was ringing from Belfast, at the end of what must have been one of the longest days of his career. “We’re tidying things up here,” he said. “Everyone’s exhausted, but we have an agreement, and it’s one that I think will stand the test of time. I know you’re not here, but I wanted to acknowledge the role you played in bringing this about.” The agreement was the Good Friday Agreement, which has, despite endless difficulties and complications (including the current mess), stood the test of time. I had played no role at all in the final negotiation, although I had been involved, over several, turbulent years, with some of the negotiations that had enabled Good Friday and which had made it inevitable. I‘m not sure how Dermot Gallagher would have known of my frustration at not being present when the final deal was done. But I’ve never forgotten his act of generosity, at the moment both of history and exhaustion, in picking up the phone to someone whose role in the process had ended more than a year earlier. We hadn’t always got on, Dermot Gallagher and I. I had first met him when he was Ireland’s ambassador to the United States, and I think he might have formed a view that some political advisers (which I was, at the time) were more uppity than others. But that didn’t stop those of us who witnessed it being more than impressed by Dermot Gallagher’s importance regarding Ireland’s influence in the United States. He had an astonishing political and media network, which was always at Ireland’s disposal, and he deployed immense charm, and no small amount of what the Americans call savvy, to ensure that Ireland was always heard when it really mattered. Diplomats from other countries have always marveled at Ireland’s access and influence in Washington — it was people like Dermot Gallagher who built that up over many years. When he came back to Ireland, from Washington, it was to head up the Anglo-Irish division of the Department of Foreign Affairs, and in that role he developed many of the key relationships that made it finally possible to reach compromises that had eluded the parties for years. Dermot Gallagher died at the weekend, after a full life and career, in which he could truly claim, if he had wished to do so, to have served his country well — and always with a smile. But, like many of Ireland’s public servants, he never made any claim for recognition outside his role. If he had lived his life as a musician or entertainer, the newspapers today would be full of his accomplishments. There would be radio programs and tributes galore. Dermot Gallagher was a servant of the public, who made an indelible contribution to the betterment of his country. His name might not be on the Good Friday Agreement, but all of those who were there know his mark. That has to be enough for most public servants. In our system, they work behind the scenes, and others take the credit. But perhaps, every now and again, it might be worth reflecting on how important they truly are. After the death of TK Whitaker, huge and deserved tributes were paid to a man who did more than most to shape modern Ireland. But there have been many, many more, men and women, of incredible stature and ability, who have devoted their lives to public service, but whose names are virtually unknown. I can think of people like Sylda Langford, for instance, who did an enormous amount to shape public policy towards children. Or Noel Fahy, who served his country as an ambassador at moments of enormous challenge, and whose quick-thinking and worried frown carried many a minister through difficult and complex negotiations. Of Finance, it was his job to ensure that not a penny of public money was wasted. 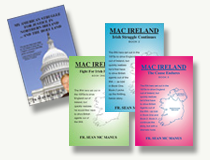 He would fight daily battles with what he saw as reckless ministers and saved Ireland millions. He never courted popularity — he just did his job. Then, there was Joe Holloway, a man who ran several government departments over a distinguished career and masterminded some of the most complex negotiations Ireland has ever been involved in. He ran afoul of several very important politicians but always stuck to his guns, if he believed there was a national interest at stake. I don’t believe that we would have had a successful peace process in Ireland, at all, without the immense work and ability of Sean O’Huiginn, in the Department of Foreign Affairs. At a time when people couldn’t see a strategy that would bring paramilitaries in from the cold and make them part of the solution, he could, and he took immense personal risks to bring that to pass. And I don’t believe he’d have succeeded without the endless skill and patience — and extraordinary craftsmanship in writing key texts — of Noel Dorr, who has represented Ireland at the United Nations, in London, and as head of the department during some of the most turbulent and difficult times imaginable. We might be in the debt of great public servants like these — and there are so much more it would take me three columns to name them — but they come and go. Any one of these public servants would have ended their careers in the UK with a knighthood, or have been asked to serve as provost of one of the prestigious universities, or done a term in the Seanad. With the exception of TK Whitaker, none of ours has ever been honored in that way. In fact, they’re totally anonymous. You won’t find most of the names I’ve mentioned on Google, and, even if you do, you won’t be able to trace the contribution they’ve made. They don’t make claims for themselves and they don’t encourage others to do so. It’s part of the tradition of public service in a republic — you do your job quietly, to the best of your ability, and then you go. Because I’ve known and worked with hundreds of public servants in my own lifetime, I think that’s a loss. Not only have they made a huge contribution, but they also have huge stories to tell and a great deal to teach us. We’ve suffered badly, in recent years, because public policy has let us down. If the truth were known, part of the reason for that has been the devaluing of public service. When you know what men like Dermot Gallagher, and his colleagues, were capable of, without ever seeking the limelight, you’d wonder what a much better place we’d be if they had been given positions of real, visible, and accountable leadership.